David and Avi Benzikry, co-founders of Spring Footwear, continue to double down on their recipe for success: Always aim high and work as hard as possible. Succeeding in the fashion business requires speed, stamina, agility, passion, ingenuity, talent, smarts and a lot of hard work. And that’s just to get a business off the launch pad. Succeeding season after season, year after year to become a sustainable, thriving operation requires all those skills on steroids, especially in times of industry upheaval and reinvention. While many companies have taken a beating during the so-called Retail Apocalypse and downsized or, worse, disappeared, Spring Footwear continues to post double-digit annual gains with its stable of comfort fashion brands: Spring Step, Patrizia, L’Artiste, Flexus and Azura. Even more noteworthy, co-founders David and Avi Benzikry credit much of the company’s recent growth to the independent channel, despite the tier’s significant consolidation and pared-down buys from surviving retailers. So what gives? How does Spring Footwear do it? The answers start at the top, with the identical Benzikry twins. One would be hard-pressed to find two individuals who work as tirelessly as they do. This isn’t just a job for them. The shoe business is their life. They’ve been all-in since day one of launching Spring Footwear in 1991. 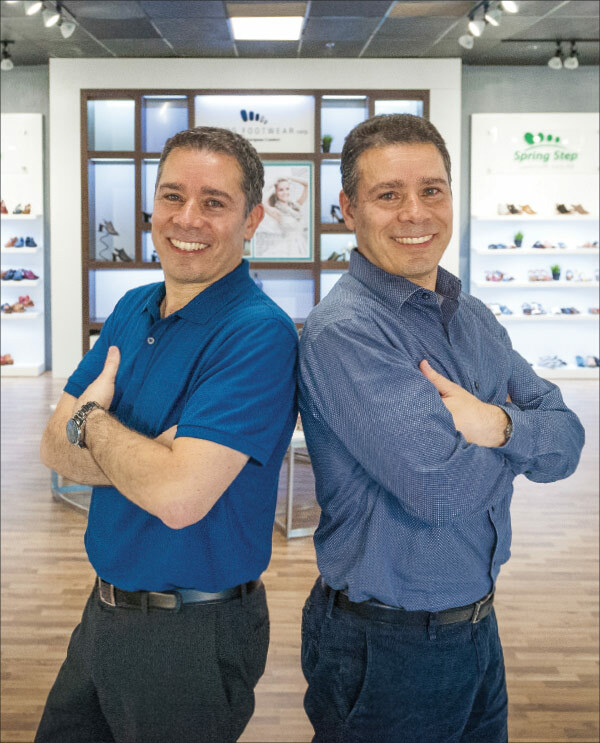 In fact, the brothers have been all-in on the shoe business since they started helping out after school, at age 6, in their father’s Israeli factory, lacing and putting pairs into boxes. It wasn’t long before they began formulating their own plans for a footwear company, which they launched upon emigrating to America at age 17. Having already logged about 10 years working in nearly all facets of shoemaking, the brothers believed they had the experience to succeed. And while it wasn’t easy, they overcame tremendous hardships and gained traction on their New York-based startup—only to shut it down to fulfil their obligation to serve in the Israeli Army. The Benzikrys returned to the States three years later—a little older, a lot wiser and as determined as ever to launch another shoe company—Spring Footwear Corporation, this time in Pompano Beach, FL. The company that started with just the Benzikrys has since mushroomed to 150 employees globally and now sells close to 3 million pairs annually. For the Benzikrys, it’s the American Dream realized. Spring Footwear’s foundation as a fashion comfort house is solid, and the Benzikrys believe the sky’s the limit for growth. Reaching new heights could involve new brands joining the portfolio as well as the company’s continued push into international markets. “We’re always searching for additional opportunities in the marketplace to enhance our portfolio while still being true to who we are,” Avi says. While you’ve both weathered your share of challenges in this business over the years, has the so-called Retail Apocalypse been more difficult than, say, the Financial Crisis? David: No question, we’re doing better than we did through the Financial Crisis. As a company, we are stronger, our brands are more mature and we feel that we’ve gained respect and sound marketshare to be able to continue to grow despite the so-called Retail Apocalypse. What has your company been doing to weather this epic realignment in retail? David: Focusing on product innovation and creativity is always what has set us apart, so we are constantly evolving to bring unique and fresh products to the market. At the same time, we’ve built strong relationships with our partners. We strive to be highly strategic around our distribution practices and constantly take advantage of new technologies. What do you attribute your recent success within the independent tier to most? Avi: In addition to great product, our team has been able to grow in this channel thanks in large part to our open-stock and in-stock capabilities. We have the necessary infrastructure to service these stores. Actually, we’re a perfect fit for how many of them like to buy and thus it makes for an easier sale. Is there a light at the end of the retail tunnel, or do we have a long way to go? David: There will always be challenges. The fashion industry is very complex and everything is moving at a fast pace. We must always work hard to keep up with the changes—from product to technology to compliance to service expectations to improved communications and to engagement with our customers. How do you see shoe retailing evolving going forward? How important might the brick-and-mortar aspect be? Avi: We believe that there will always be a place for the specialty stores that can offer personal service and unique selections. Retail isn’t dead, it’s just changing. Our brick-and-mortar channel will continue to be an important part of our business. We have a very broad demographic and keep in mind the fact that our customer is not only interested in the transaction, but also in the whole shopping experience—looking for a unique product, socializing, etc. Retailers will need to continue to evolve and stay up to date with what the customer expects and continuously look to improve the experience they provide. At the same time, we know the internet isn’t going anywhere, and we must service customers who prefer to shop that way. Like on Amazon, for example. How do you view them as a customer? David: Amazon is a very big business that we just can’t ignore. We build special collections for them that will not conflict with our other channels. We are fortunate that we are product rich and have that capability. What else are you doing to try and make sure all your channels coexist (at least somewhat) peacefully? Avi: We have multiple brands and each one serves different needs and channels. Spring Step is our original European comfort brand, offering traditional comfort constructions and styles. L’Artiste shoes are all uniquely designed, incorporating hand-painted leathers and are functional works of art. Azura represents more modern fashion. Flexus is supportive, extreme comfort all made with a direct-attach process. Patrizia is our vegan-friendly line featuring new, innovative materials covering many of our core competencies and infused with fast fashion. Spring Step Professional offers comfort with oil- and skid-resistant technology to those in the medical and hospitality workforce. Spring Step Men is contemporary fashion. In addition to this, we have an established MAP policy that we monitor closely and make adjustments whenever necessary to protect our retailers. Which brands have the most potential? David: That’s a tough question. It’s like answering to who’s your favorite child. We have seen tremendous growth in all of them, and we believe each has great and different opportunities going forward. How important is your direct-to-consumer channel going forward? David: Our main focus is to build fresh and unique products relevant to our target customers, and specialty retailers help us reach those audiences by developing a personalized connection with them. The fact is selling footwear is a very lengthy process that requires a lot of time and the attention of many individuals. It is kind of like matchmaking, finding and introducing new products that fit for the right customers. And we depend on our retailers to present our brand and showcase what we do best. Having said that, our direct-to-consumer segment is a very small percentage of our overall business and primarily exists to showcase our brands in their entireties. It’s our place to engage and build relationships and form additional venues for communication with all our customers. But it’s not our primary focus at the moment. Our business model is focused on selling products to retailers. While that business model remains largely the same, how would you say the company has changed most over the past five years? David: I’d say we’ve strengthened our relationships with consumers. We’ve established a loyal base and growing following. Today, the consumer is an integral part of our company development and has dramatic effects on our actions. As we’ve grown and understand their wants and needs better, our product offerings have been refined. There’s more clarification among our brands, which has been a major factor in our revenues doubling. Where do you envision Spring Footwear in five years? Avi: Continuing to grow and becoming one of the leaders in fashion innovation and comfort technology. We will continue to leverage our growth through our strong relationship capabilities and our loyal customer base that we’ve worked so hard to maintain. Peering into your crystal ball, what might the footwear industry look like in 10 years? Will there even be shoe stores as we now know them? Avi: For sure, shoe stores and boutiques are not going anywhere. Of course, there will also be new emerging concepts that will become popular. Along those lines, I think our retailers will become more like decorators and consultants, working directly with customers to deliver an increasingly personalized experience, utilizing new technologies. Online will also continue to grow. But as a U.S. company, we are obligated to comply with many requirements and regulations to sell shoes. Meanwhile, the global economy is creating a disadvantage for U.S. companies, allowing outsiders to conduct business here without any of these regulations and tax obligations. This is a big issue that needs to be addressed by our government, and I believe this will mark another change that will take place in the marketplace. Seeing how you both are based in Israel now, any incentive to move the company headquarters to get around these regulations possibly? Avi: Our company is proudly U.S. based and follows all U.S. laws and requirements. And since we are both proud American citizens, we have to pay taxes no matter where we live. Speaking of U.S. regulations, is President Trump’s tariff policies impacting your business? Are you diversifying your sourcing portfolio as a result? David: Of course, the tariff policies with China will affect footwear pricing and supply chain. Fortunately, we are highly diversified. We still have more than 50 percent of our products sourced in Europe, and we deal with many different countries worldwide. We’ve built strong global partnerships and are able to shift production fairly quickly. Avi: I give (President Trump) a lot of credit for all the changes he’s trying to make. He’s working hard to protect American interests. It’s not an easy job or position, but I wish him the best. Looking back to when you first launched this company, did you ever envision in your wildest dreams this level of growth? David: Our vision remains the same as when we first launched: We wake up every day and do the best we can for that day to improve and deliver comfortable and beautiful shoes that look and feel great. We’re very fortunate and blessed to be where we are. America has provided us with great opportunities. Having worked in this business since childhood, you’ve weathered the up and downs, survived and thrived, and probably seen and heard it all. Is there anything that still surprises you about this business? Avi: You’d be surprised—every day things are changing in the shoe business. We live in a very dynamic space, and we still learn something new every day. It’s what keeps us going and what keeps us relevant. What are you most proud of as it pertains to the company you both have built? Avi: We are proud of our loyal team as well as our loyal customers that have remained with us from the very beginning. David and Avi: We are extremely fortunate to be able to be born into a business that we love. We are true shoe lovers. We love the never-ending challenges, endless possibilities and complexity that keeps us busy, as well as the constant evolution within the marketplace—all of which creates a very purposeful approach to moving our company forward. We are competitive by nature, and always put up the best fight to win! David: It’s All About Who You Hire by Morton Mandel. Avi: No Room for Small Dreams by Shimon Peres. David and Avi: Seeing young and motivated talent chasing their dreams. David and Avi: (Nike founder) Phil Knight. David: My daughter playing the piano. Avi: The sound of the ocean. David: Don’t be afraid to take risks and leave your comfort zone. Avi: Our father always impressed upon us to find solutions to problems on our own. Avi: I wish I had a better voice, so I guess singing. David: I wish I could dance. God hands the controls over to you for a day. What’s the first thing you do? David and Avi: Cure the sick and feed the hungry!